This was a bit of a stretch for me and a great exercise at stepping out of the box creatively! Had we gone with some of our original ideas – chalkboard, notebook, Comic Sans type…(just kidding), it would have been “cheesy”, and that’s too easy. But Katherine had great vision and it was so much fun to work with her and turn her ideas into a design that set the tone but kept it elegant and tasteful. The centerpiece of the invitations was the custom-designed stamp that was used repeatedly – hand-stamped on each invitation, return address label, and wedding favour bag. Sure, we could have printed the stamp with the rest of the invitation, but by opting to actually stamp each invitation manually, it really leant an authentic feel to the whole package. 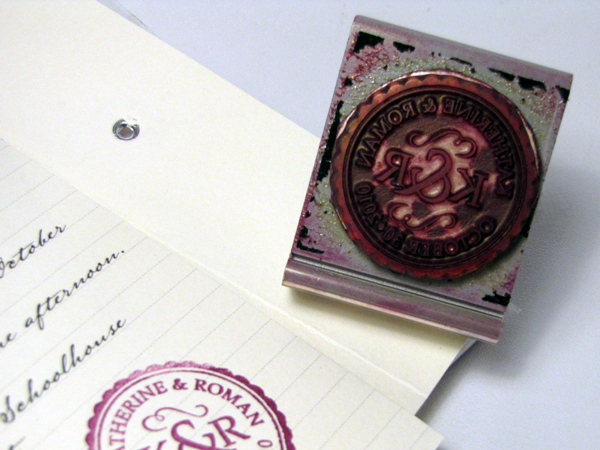 The stamp became the “logo” for the wedding, and was even incorporated as a watermark in their Thank You photo. 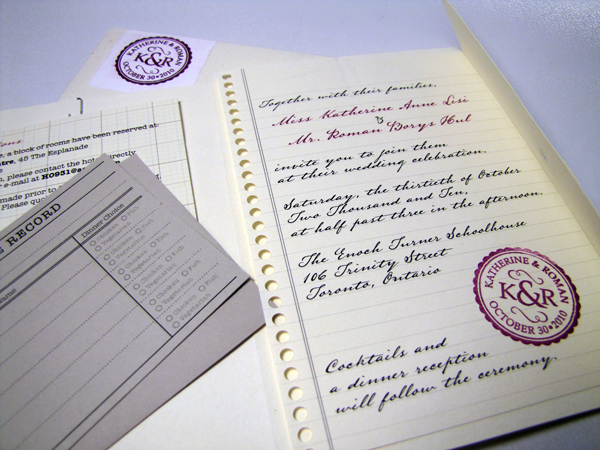 The invitation itself was meant to look like a hand-written note ripped out of a coil-bound notebook. A gorgeous vintage script font was used and we printed the invitation on a textured cream stock and had it punched. 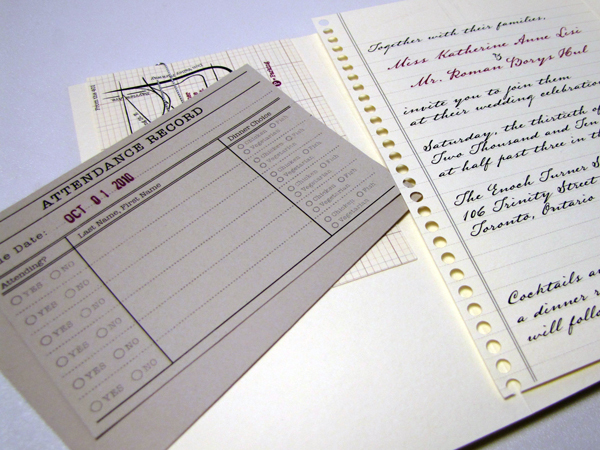 Instead of RSVP cards, an “Attendance Record” (inspired by an old library card) let guests respond with their menu selection. Map and hotel information were printed on replica graph paper to complement the rest of the pieces. And the piece de resistance was the miniature file folder that housed the whole package! Hand cut, folded, punched and tied, it was the perfect container for this unique wedding invitation package. Tanya, this is my favourite; fantastic! So creative. I would love to have recieved this invitation. My next big event will be sent your way. Incredible talent. Thanks Amanda – it was a great project and wedding too! Tanya, you did a beautiful job with our wedding invitations. You managed to see the image in my mind and brought it out in beautiful detail. Your suggestions and ideas went a long way to making the perfect invitation; which gave our guests a hint of what to expect at the celebration to come.